BB crafts is a leading group that is known for providing the best quality craft and wedding supplies. Here you get hold of all the wedding decoration stuff at affordable prices. 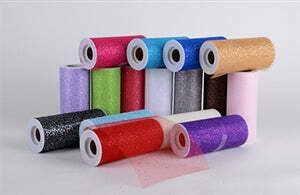 We can provide you with a massive collection of glitter net tulle fabric. Moreover, the best thing is that we are capable of putting forward almost all the shades that fabric can be dyed in. By using these types of wedding decoration and craft supplies that we are offering, you can actually make people stunned with your innovative decorations using the glitter net tulle fabric. The shades we provide can be adjusted with a variety of party themes to make the place look magnetizing for the guests. Our team of experts promises to deliver all the orders within the given time frame that is 48 hours. So, there is no need for you to get anxious about the quality of the products we provide.